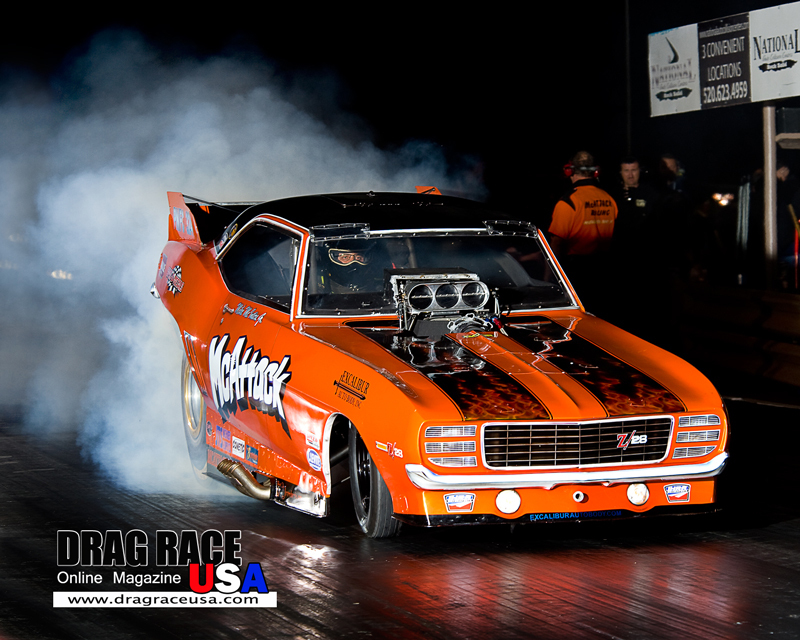 CHANDLER, Ariz. (February 24, 2015) – Kalitta Motorsports preview the CarQuest Auto Parts Nationals at Wild Horse Pass Motorsports Park in Chandler, Ariz. This is the second race of 24 in the 2016 NHRA Mello Yello NHRA season. Del Worsham, driver of the DHL Toyota Camry Funny Car and defending 2015 Funny Car champion, left Pomona mere inches from earning his first Winternationals win, but is not looking at the loss as a disappointment. With so much recent success, Worsham is confident in his DHL Toyota team heading into the second event of the season. Worsham, who has been a part of five of the last seven NHRA Funny Car final rounds, has been on a hot streak since the beginning of the 2015 Countdown for the Championship. In the last seven events, Worsham has earned a NHRA-best 20 round wins. The consistency in the Nicky Boninfante and Jon Oberhofer-tuned Camry led to round wins over Cruz Pedregon, his teammate Alexis DeJoria and John Force in the season opener. The DHL team moves to the desert of Phoenix with a solid track record there as well. Before joining Team Kalitta, Worsham earned two wins at Wild Horse Pass Motorsports Park in 2002 and 2004. Last season, Worsham qualified third and earned round wins over John Hale, Chad Head and Robert Hight, before coming up just short in the final. He returns to Phoenix looking for his latest win and plans on making that next step into the Winner’s Circle. Fans can meet Worsham as he signs autographs as part of the Mello Yello Powerhouse on noon Saturday. Doug Kalitta, driver of the Mac Tools Top Fuel dragster, had an encouraging start to the new season as he debuted the new in-house Bounty Hunter Kalitta chassis to rousing success at the Winternationals. Jim Oberhofer and the entire Mac Tools team continued to make gains throughout qualifying before setting a blistering pace in the final qualifying effort that nearly stole away the no.1 qualifying position. Kalitta rolled into Sunday as the no.2 qualifier and defeated Scott Palmer in the first round and the defending NHRA Mello Yello champion Antron Brown in the second round. 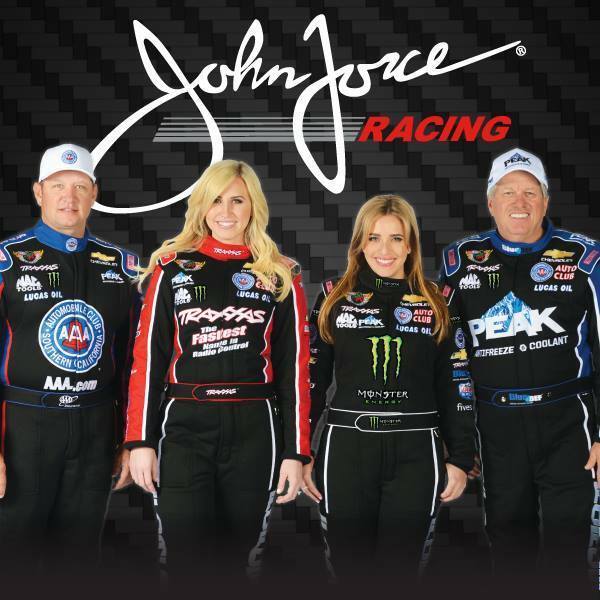 That round win set-up an all Kalitta pairing in the semi-finals as Kalitta took on J.R. Todd in the first ever live round to air as part of the new Fox Sports NHRA television deal. Todd encountered problems, yielding the final round appearance to Kalitta. Although he came out on the losing end of a close final, Kalitta’s confidence is at a high as he transitions to the second race of the season. Kalitta was in last season’s Phoenix final round, just missing the Wally. He does own a Phoenix win as he celebrated victory in 2001. He also has an outstanding qualifying average at the track. Kalitta has two no.1 qualifying efforts in the past three seasons. Kalitta is also milestone bound. A semi-final or better finish will help him become just the third driver to earn 550 round wins exclusively in the Top Fuel class and 12th driver overall in all NHRA pro classes. If Kalitta can find the Phoenix Winner’s circle, he will move past Kurt Johnson into 11th all-time in NHRA history for round wins. 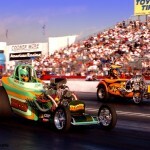 J.R. Todd, driver of the SealMaster Top Fuel dragster, had a strong start to the new season. With his best effort in Pomona since the 2014 season, Todd starts the season ranked fourth in the standings which already matches his 2015 season high. The Winternationals effort has Todd riding high leading into the second race of the season. Todd struggled in day one of qualifying with a couple mechanical issues. However, Connie Kalitta and Rob Flynn turned the corner heading into Saturday and had a solid SealMaster machine going into race day. The driver was ready too as Todd had a solid light against his first round opponent, Brittany Force, and led to the stripe earning the first holeshot win this season in the series. He followed that up with a clean pass over Terry McMillen, before tire smoke saw him fall in the intramural battle versus his teammate, Kalitta. Last season, Todd got his season kicked in gear in Phoenix. The team was strong throughout qualifying picking up multiple bonus points and a top three qualifying effort, before earning a first round win over McMillen. 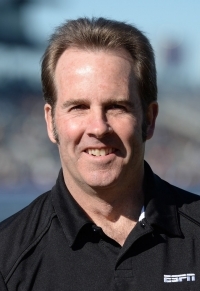 However, Todd is aware of the recent success for Kalitta Motorsports at Wild Horse Pass Motorsports Park and is searching for more. “I am definitely looking forward to returning to the track with the SealMaster ride,” said Todd. “We are planning on keeping this early momentum rolling.” That very cool SealMaster ride was just named as one of the top new schemes in the NHRA according to experts. Todd will be a part of his first SealMaster Track Walk of the season as he walks the Wild Horse Pass Motorsports Park with fans prior to the race beginning on Sunday. Alexis DeJoria, driver of the Tequila Patrón Toyota Camry Funny Car, will never forget this race just two seasons ago. DeJoria qualified fourth and moved through the field eventually reaching the final round versus former champion Robert Hight. DeJoria toed the line and took off. Hight smoked the tires, and the Tequila Patrón Toyota Camry team were Funny Car winners for the first time. Now two seasons later, DeJoria is ready for a return to victory. She started the season strong. In her 100th career event, DeJoria earned a round win at the Winternationals before coming up short against her teammate Worsham. DeJoria is also coming off a strong effort in Phoenix. One season after her first win, DeJoria returned to Phoenix and achieved a semi-final finish. The “NITRO BABES” pose for a photo with a fan at the drag races! FOREST LAKE, Minn.—Fresh on the heels of the best-selling book Lost Drag Strips comes a new look at other long-lost and forgotten drag racing facilities from the 1950s, 1960s, and 1970s. In the first volume, the author examined the birth of drag racing and its subsequent popularity that invaded every city and community across America. The first volume was great, but readers demanded more! 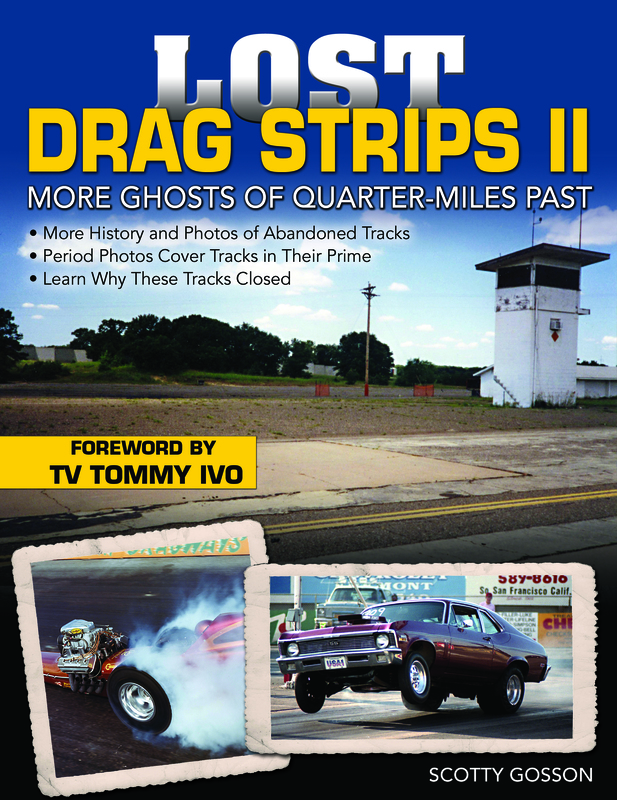 Lost Drag Strips II picks up where the first volume left off, covering even more tracks with archival photos of racing in the tracks’ heyday, the cars that ran there, and coverage of the tracks as they exist today. This volume also includes some of the tracks that survived, those that fought off the economic demons and the urban sprawl and continue to run today. Tracks in this volume include: Fort Wainwright/Racing Lions Motorsports Park, Avenue G Drag Strip, Fremont/ Baylands Drag Strip, San Fernando Drag Strip, Fontana Drag City, Inyokern Drag Strip, Kahuku Air Strip, Las Vegas Speedrome, Continental Divide Raceways, SRCA Drag Strip, Southwest Raceway, Willow Run Raceway, Minnesota Dragways, KCTA Drag Strip, Detroit Dragway, Niagara Airport Dragstrip, New York National Speedway, York US 30 Drag-O-Way, South Mountain Raceway, State Capitol Dragway, La Place Dragway, Yellow River Drag Strip, Thunderbolt Dragway, and more. Scotty Gosson worked his way from wrecking yards to rod and custom shops as a mechanic and fabricator. 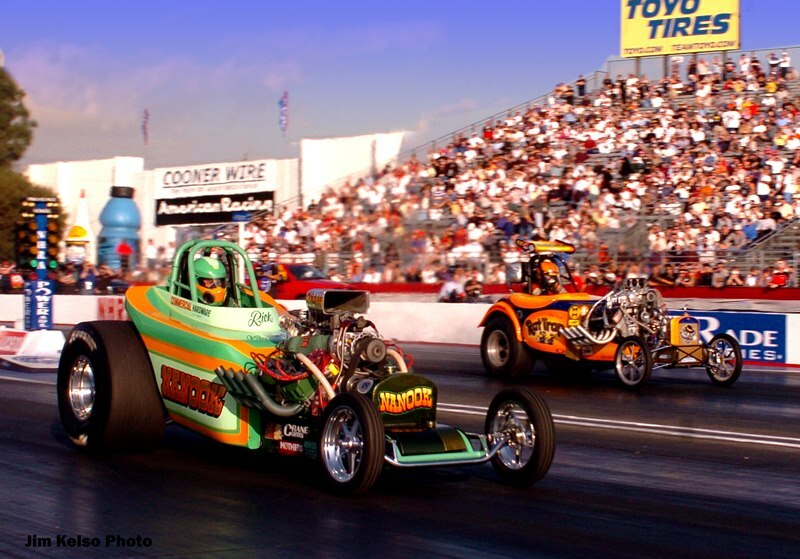 His involvement in drag racing and landspeed racing led to a successful career in the print industry, where he is a popular magazine feature freelancer. 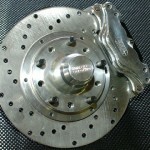 His work has appeared in Drag Racing USA, Hot Rod, Car Craft, Rod & Custom, Hot Rod Deluxe, and Goodguys Gazette. Other CarTech books by Scotty Gosson include America’s Coolest Station Wagons; Rat Rods–Rodding’s Imperfect Stepchildren; and America’s Wildest Show Rods of the 1960s & 1970s. The 8.5 x 11” paperback (ISBN: 978-1-61325-223-9) features 176 pages packed with 249 photos. 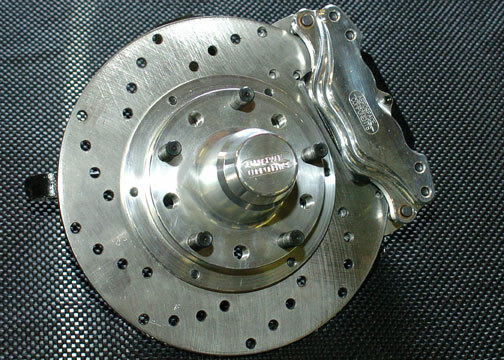 This April 2016 release may be ordered for $29.95 plus $6.95 shipping and handling by calling CarTech at 1-800-551-4754 or by visiting www.cartechbooks.com/lost-drag-2. 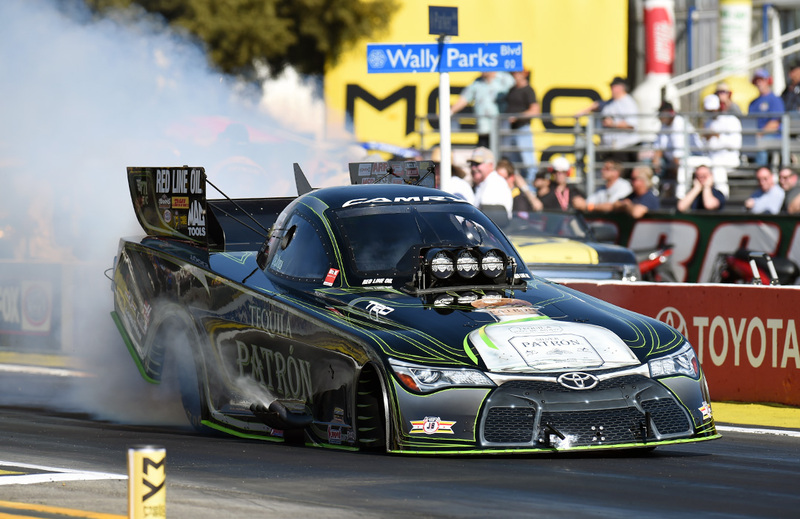 Alexis DeJoria, Driver: It feels good to be back in my Tequila Patrón Toyota Camry. This race is a milestone for me- it marks my 100th pro start in a nitro Funny Car. It’s a dream come true and couldn’t be better. I’m with the best group of people I could possibly be with. It’s the first race of the season and I just can’t say enough about my team. I have so much faith in them. I’ve never felt more confident and more solid in this race car than I do now. I just have to give a lot of respect to my guys for that. I think this year is going to be incredible. We had three really good qualifying runs this weekend- a 4.02, a 4.04 and on this last one, we finally got into the three’s [seconds]. We’re sitting fourth and we’re in the top half of the field, pretty feeling solid. We’ll see what happens tomorrow.